We offer two levels of representation. Electronic and standard mail delivery is recommended for those that have active litigations and multiple State correspondence and filings. Standard mail delivery is recommended for those that are in the Illinois area and can receive their correspondence in a matter of days with a low amount of State correspondence activity and filings. Representation duration is 1 year from the first to occur: 1) 90 days post payment; or 2) the accepted filing with the State of Illinois that names Illinois Registered Agent as your registered agent. 1. Complete the Required Info form by clicking on the link below. Once submitted you will be returned to this page. 2. Click on the entity type and desired delivery that you would like from the list below. 3. Process your payment through PayPal. You will be directed to our information immediately upon payment acceptance by PayPal. We will send a written confirmation by email to the individual(s) listed on the Required Info form upon our receipt of payment confirmation from PayPal. Prior to purchase, please complete our " Required Info" form. This is how we service your account. A U.S. Corporation doing business in one state when incorporated in another is considered a foreign corporation. A U.S. not-for-profit Corporation doing business in one state when incorporated in another is considered a foreign entity. A U.S. company doing business in the state in which it is organized is considered a domestic entity. A U.S. company doing business in one state when organized in another is considered a foreign entity. 2) the acceptance of your filing with the Secretary of State of Illinois. Illinois Registered Agent will confirm your filing status and notify you of your "effective" date and "anniversary" date with Illinois Registered Agent, Inc.
Services are in full force and effect for 1 year from effective date. You do not need to be a PayPal subscriber to purchase our services. 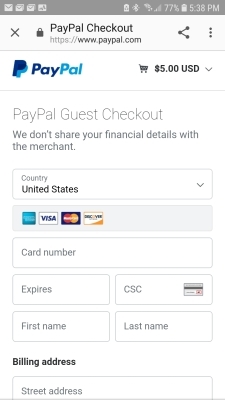 Use the Guest Checkout on PayPal, enter your card number and billing address as you would any other online purchase. You will be delivered to our information for your forms upon acceptance by PayPal. Please complete a required Info form prior to purchase so that we can set up and service your account. We cannot provide representation without this information. All fields on the form must contain information whether it applies to your situation or not. If it does not, please place N/A in the field affected. New Clients can complete the transaction using the Guest option and proceed through the prompts. Be sure to chose to return to vendor website to retrieve our information.